With playoffs in sight, which underrated Nuggets role players will need to step up? 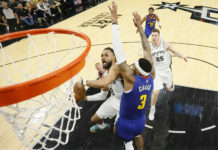 With expectations at a nearly all-time high for the Denver Nuggets 2018-19 season, a number of overlooked players may be the difference maker in the franchise making its return to the postseason for the first time in five years. Denver’s offseason started with the selections of Michael Porter Jr. and Jarred Vanderbilt in the 2018 NBA Draft. Each of them have potential to be huge pieces for not just next season, but many years to come. Those three along with the extensions of Nikola Jokic, Will Barton, and Torrey Craig give the Nuggets a solid foundation heading into a boom-or-bust season for head coach Michael Malone. Even with the core set in stone, a number of bench players will have a major impact on the Denver’s potential success next season. So without further ado, here are the seven under-heralded players who could massively impact the Nuggets 2018-19 season. Other than Isaiah Thomas (not a sleeper), Lyles may be the Nuggets most important player off the bench next season. After being acquired on draft night a year ago, Lyles was often cast in the shadow of the player he was traded for — Donovan Mitchell. Even with unfair comparisons to Mitchell all last season, Lyles still had his best season as a pro posting career highs of 9.9 points, 19.1 minutes, and 4.8 rebounds per game. Lyles also shot a career-high 49 percent from the field and made 38 percent of the 218 threes he attempted. The scoring ability Lyles showcased last season is something the Nuggets desperately need again this season. With Thomas being the only other scorer off the bench, Lyles projects to be the secondary option off the bench on the offensive end of the floor. One of the more underrated parts of Lyles game is his explosiveness and it is something he showcased much more often last season. Lyles’ explosiveness and offensive ability makes him a matchup nightmare for defenses and it’s what makes him one of the Nuggets most important rotational pieces. If Lyles is able to take the next step in his game-averaging in double figures and shooting over 40 percent from three, it would give him the tools to be a major piece in the Nuggets playoff push in the Western Conference. As the Nuggets backup center, Plumlee thrived during his first full season with the team. After earning a three-year, $41 million extension last offseason, Plumlee went into a season where expectations for his personal performance were at an all-time high. Plumlee started in 26 of the 74 games last season averaging 7.1 points, 5.4 rebounds, and 1.9 assists per game while being fully willing to do whatever dirty work that was needed. Plumlee’s assist totals tied him for tenth-best amongst centers and it is what projects him to be a great fit next to Thomas. With Plumlee’s screening ability and rim-rolling acumen, it makes him and Thomas an offensive nightmare for opposing defenses to try and stop off of the bench. Thanks to how effective Plumlee is as a screener, it will create open looks for Lyles, Torrey Craig, and Malik Beasley as well as room for Thomas to operate. Plumlee’s finishing ability is one of his greatest traits, but the best trait he unquestionably gives the Nuggets off the bench is defensive energy. 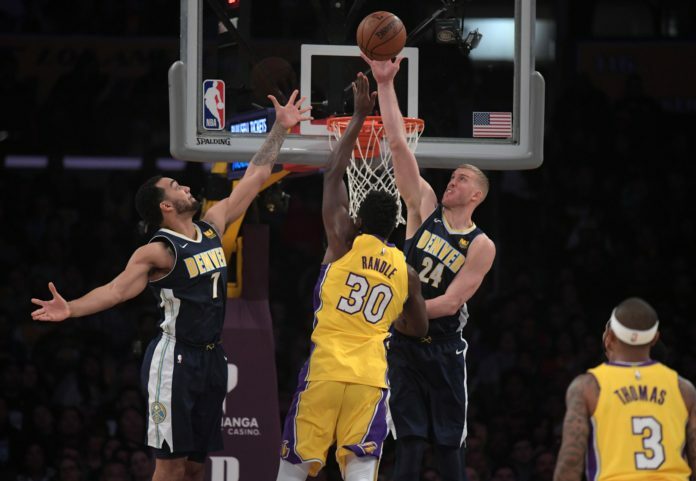 Plumlee was the Nuggets leading shot blocker last season at 1.1 blocks per game and its one of the main reasons he is so valuable to the Nuggets. Every team needs a rim protecter, and Plumlee fills that role for the Nuggets. Plumlee’s defensive tenacity makes him a solid fit next to the rest of the Nuggets bench unit, and it is one of the biggest reasons why he should not be an after thought on Denver’s roster going into next season. The third year guard out of Florida State is going into undoubtedly his most important as a Nugget. Beasley is coming off a summer league where he averaged 16 points and 4.3 rebounds in the three games he played in Las Vegas. During summer league, Beasley showcased an explosiveness that could pay huge dividends off the bench for the Nuggets next season. 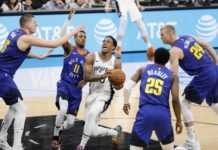 Beasley also possesses a defensive tenacity that would be a welcomed sight to a Nuggets second unit based around the idea of trying to outscore the opponent at all costs. During his three games at summer league, Beasley averaged 2.3 steals per game while also showcasing his ability to score in transition. Beasley has shown flashes of this in each of his first two seasons, but his 8.9 minutes per game average has made it tough for him to display his talents consistently. With Will Barton slotting in as the Nuggets starting small forward, Beasley now projects to move into the role as the teams back up shooting guard. Playing next to Thomas, Lyles, Craig, and Plumlee puts Beasley as the third scorer off of the bench. With Thomas and Lyles leading the way offensively, Beasley has the chance to be a defensive tone setter along with Craig and Plumlee. Beasley’s ferocious energy can be contagious and it is something that makes him an important piece to the Nuggets bench unit next season. Going into last season on a two-way contract, Craig might have been the best story from the 2017-18 season for the Nuggets. After coming over from Australia and betting on himself, Craig made a name for himself in a Nuggets uniform and it is what has earned him his two-year contract worth $4 million that he agreed to this offseason. Betting on himself has certainly paid off and it has led him into a major role with the Nuggets heading into the 2018-19 season. Projected to be the Nuggets back up small forward, Craig slots in as arguably the teams best defender among the players on the second unit. With Craig playing off the bench, it’ll give him the opportunity to guard the opposing teams most dynamic scorer off the bench; players like Lou Williams or Jamal Crawford. Almost every team has that one player who can score off the bench, and luckily for the Nuggets, they have a player in Craig who can shut that player down. Another undervalued part of Craig’s game is his ability to collect offensive rebounds and generate second-chance points. Of the 3.3 rebounds he averaged per game last season, one of those came on the offensive end of the court each night. Craig uses his basketball IQ on the offensive end of the court to find the soft spot of the defense where rebounds are more likely to drop. As the rest of the defense is caught napping, Craig takes advantage of the easy lay up to give the Nuggets an easy bucket. Plays like that are what make Craig such a valuable piece to this Nuggets roster — both on the offensive end of the floor and especially on the defensive end. With Craig now locked up for the two more years, his contributions will be a huge piece on this Nuggets roster next season. Just like Beasley, this is a huge season for Hernangomez. Going into his third year with the franchise and second fully healthy season, Juancho has an opportunity to have a bounce back campaign for Denver. After catching mononucleosis to start last season, Juancho was never fully healthy and it certainly showed in the 11.1 minutes per game last year compared to 13.6 during his rookie season. It wasn’t even so much the minutes played as it was games missed considering he played in 37 games less last season than he did the year before. Still, even after missing most of the year because of injury, Juancho still showed flashes of being a dynamic three-point shooter. After shooting 40 percent from three his rookie season, Juancho shot just 28 percent from deep last year and made just 14 threes. That is certainly a major drop in production, but the games played and opportunities he had have a lot to do with that. On the contrary to what Beasley did, Juancho did not compete with the Nuggets at summer league, but instead competed with his home country of Spain in the 2019 FIBA World Cup Qualifiers. In two games, Juancho averaged 10.5 points, six rebounds per game, and was a big piece in Spain’s two victories over Slovenia and Belarus. If Juancho finds a way to surprise Nuggets brass in training camp, it could pay huge dividends in his playing time next season. After a lost season a year ago, Juancho comes into his third NBA season with a lot prove. A solid offseason with Spain is a strong first step, with his next step possibly being a contributor off the bench for the Nuggets next season. Porters situation is tough in that he shouldn’t be considered a sleeper as the 14th pick in this years draft, but the question marks regarding his health are what make him a player the Nuggets can’t currently count on. It was reported just last month that Porter believes he’ll be 100 percent going into next season, but the Nuggets organization has the ultimate say in how much he’ll play. If Porter does play next season, he’s another contributor who can help one of the best offenses in the NBA. Even with just three collegiate games under his belt, Porter showcased a scoring ability in high school that not many 20 year olds have shown. Even if Porter misses the beginning of the season, an addition like his could propel the Nuggets into a solid second half of the year leading up to the playoffs. The only question mark with Porter is health, but even if he redshirts the beginning of next season, he’ll still be a sleeper if he’s able to give the Nuggets any minutes during what hopes to be a playoff push. Just like in Porters situation, Vanderbilt is coming off an injury that forced him to miss the end of his freshman season at Kentucky. 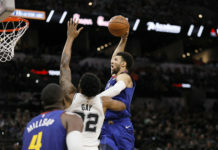 Numerous injuries forced Vanderbilt to play in just 14 games during his lone season with the Wildcats, but the Nuggets still felt comfortable selecting him with the 41st selection in the 2018 NBA Draft. A tenacious rebounder and ferocious defender, Vanderbilt could end up being the Nuggets best defender on the roster even over players like Paul Millsap, Plumlee, and Craig. Defense and rebounding are the two things Vanderbilt showcased during his freshman season and it is the exact reason he caught the eye of Nuggets President of Basketball Operations Tim Connelly. “In the second round we added Jarred Vanderbilt, one of the best rebounders we’ve ever seen. High energy guy, multiple position guy, just plays with a real passion, plays with a constant motor,” Connelly said in his post draft press conference. Vanderbilt projects as the possible power forward of the future once Millsap’s time with the franchise is over. With the injured foot still a concern, it is tough to project just how many minutes Vanderbilt will play next season. If the rookie does see the court, he gives the Nuggets a phenomenal rebounder and defender to compliment a strong offensive roster. All the players mentioned above have the potential to be huge pieces in the Nuggets playoff push next season. With the Nuggets building so much of their system around Nikola Jokic, it puts even more pressure on the second unit to perform when Jokic is off the floor. For a bench unit that struggled last season, the addition of a backup point guard in Thomas should hopefully help settle things down for guys like Lyles, Beasley, Craig, and Plumlee. Having ten or eleven solid rotation players would be huge for Nuggets head coach Michael Malone to have at his disposal. In what could be a long season with a playoff berth on the line, the Nuggets will need all hands on desk to help them get back to the place they have been searching for since the 2012-13 season came to a close — the playoffs.